How do you know when to harvest garlic bulbs and if they have matured to the right point for harvest? Each leaf on the above-ground garlic plant represents one potential papery wrapper around the mature bulb. Having well developed, fully intact wrapper layers means that your garlic will store longer and keep its wonderful aroma and flavour. The trick is to let the plants begin to die back, but harvest before all the leaves have turned brown. The top-most, green leaves extend down, into the soil, into the heart of each garlic bulb. 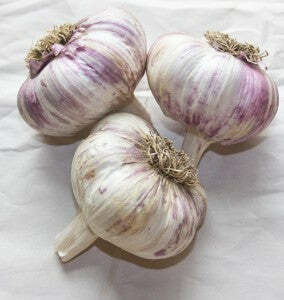 When the lower two thirds of leaves have dried up and turned brown, your garlic bulbs will be at their best. Because there are still green leaves, there is still quite a lot of moisture left in the bulbs. The process of allowing this moisture to reduce naturally is called “curing” and will increase the storage life of your garlic by months. Harvest your garlic bulbs gently. Take time to loosen the soil above each bulb. Avoid piercing the bulbs you loosening the soil some distance from each one with a fork. Do not rely on simply pulling upwards on the stem, but rather pull gently and at the same time coax the bulb out of the soil with the other hand. All this fuss will be worth it if you can extract your garlic without damaging the protective layers. Once your bulbs are dug, lay the plants in a single layer somewhere that is dry, airy, and out of direct sunshine. Leave the plants (turning them every few days doesn’t hurt) like this for at least a week. You want the green leaves to dry up and turn brown on their own. This can take several weeks if a lot of moisture is present in the plants’ tissues, so play it by ear. When the bulbs are cured, and no green is left showing on the upper leaves, the garlic will be ready for cleaning and storage. We prefer using a toothbrush to loosen and scrub away any soil still stuck to the bulbs, and trim the roots with scissors. This is the time to braid soft-neck garlic. For hard-neck garlic, trim the stem to within about three inches from the bulb. If you notice that the stem is pliant or seems to still have a moist core, it’s worth letting the garlic dry for another week. Garlic netting is the best way to store hardneck garlic bulbs, but they can also be tied in small bundles and hung for easy access in the kitchen. Save your biggest, best looking bulbs for planting in September – or choose some new garlic varieties. Either way, plant lots of garlic. It’s one of the most economical garden crops. More on How to Grow the Best Garlic.